First, let us look at some multiples of gote positions. The score of this position is +4 (for Black). If White plays first the result is the same (e. g., - ). There are 2 copies of the original position, so the count of each is 4/2 = 2. Regardless of who plays first, the score is +5. Since there are 4 copies, each has a count of 1 1/4. Note that the number of copies is a power of 2. The final result is +11. The score is +11 regardless of who plays first. There are 8 copies, so each one has a count of 1 3/8. Note that the number of copies is a power of 2, and that the second player plays last. Now let's look at some sente positions. If Black plays first the score is 5. If White plays first the score is 4. One instance does not give us an answer --We did not think it would--, but it tells us that the count lies between 4 and 5. When Black plays first the score is 9, for an average of 4.5. When White plays first the score is 8, for an average of 4. Still no answer, but we now know that the count lies between 4 and 4.5. When Black plays first the score is 17, for an average of 4.25. When White plays first the score is 16, for an average of 4. Enough! The trend seems clear. 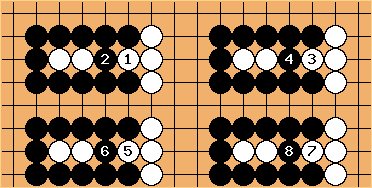 If we have N copies, the score when White plays first is 4N, for an average of 4, but the score when Black plays first is 4N + 1, for an average of 4 + 1/N. We are never going to have a miai, no matter how many copies we have. So what is the count? We have to take 4 as the count. If that is not clear, suppose that we decided to take the average of 4 and 5, or 4.5. Then our count for ten copies would be 45, but we know that the score will be either 40 or 41. 4 is the only count where the error is bounded. We will never be off by more than 1. When Black plays first the score is 1, for an average of 1/3. When White plays first the score is 1, for an average of 1/3. Bill: This example occurs frequently in yose books. When there are 3 copies of this basic ko, it is apparent that each has a count of 1/3. You may verify that 3N copies are all miai, with the same count for each. Ko threats do not matter. Suppose, for instance, that when Black plays first and takes a ko, White plays a ko threat that Black must answer and takes the ko back. Now Black simply takes another ko to return to an equivalent position minus one White ko threat. There is a slight snag, however, as we see with 6 copies. After in diagram iii, we have returned to the position at the beginning of play in diagram ii, with the same player to play. It is possible to go on forever, with no result. (This takes the cooperation of the players, however.) So for analysis we need some way to prevent indefinite repetition. A superko rule will do. 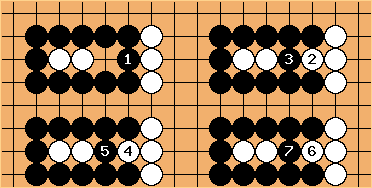 Black has captured 2 White stones. When Black plays first the score is 0, for an average of 0. When Black plays first the score is again 0, for an average of 0. Bill: For this ko multiples of 4 are miai. Note that, as above, ko threats do not matter. Kos are, at first blush, problematical for the method of multiples because they are not independent of the rest of the board. The ko threat situation may be critical for determining the count. However, as victim's examples show, when the multiples are miai, ko threats do not matter. Now, there are kos where that is not the case, where the ko threat situation affects the count. Such kos are called hyperactive, while kos such as the above examples, where the ko threat situation does not affect the count, are called placid. Note on fractional counts: Some people object to fractional counts because the final scores of go games are integers. There are two answers to that. First is that, if the game is not over, a fractional count can serve as an estimate of the local score. The second is that, as with these examples, you can have a whole board position that is miai, and therefore with a definite score, that includes regions with fractional counts. Hyppy: Just throwing a twig in the fan here on the example above. Bill: Yes, to use the method of multiples you have to find correct play. :-) is the losing play. Now Black can get only 4 points.